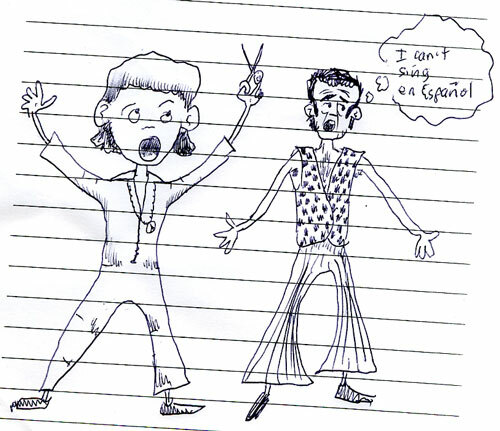 A request from the last job, two of my editorial pals as members of the Scissor Sisters. Apparently the request was the result of a strange dream which itself was the result of the weekly Friday afternoon dance party in the office in which a few folks blast out a rollicking tune and these two usually belt out their best falsettos. And, by the way, the one on the right doesn’t speak Spanish. This entry was posted in doodle, doodles, music, requests. Bookmark the permalink.